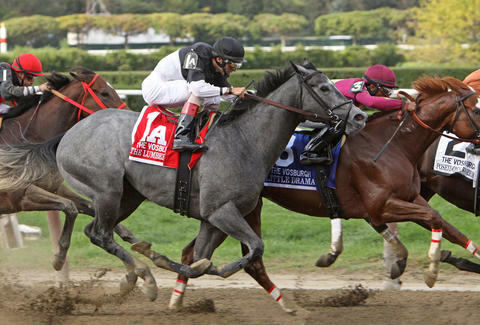 The Belmont Stakes, the third and last competition of the Triple Crown -- basically the World Series of horse racing -- is coming to Belmont Park in Elmont, NY this Saturday, June 10. The namesake headlining race closes out the Belmont Stakes Racing Festival, a three-day affair of eating, drinking, performances, and, of course, plenty of opportunities to win (or lose... ) some money. Whether you’re into betting on horses or not, the Belmont Stakes is a great way to spend a summer Saturday (and potentially wear a ridiculous hat). Here’s what you need to know to get the most out of your day (and your bets) at the race track this weekend. It’s best to buy your tickets on Ticketmaster now. If you decide to go at the last minute, especially on the big day, tickets may be sold out when you get there (and if they’re not, they’ll be cash-only). General admission (aka Grandstand admission) is the least expensive at $25 ($30 at the door on Saturday), but you’ll find pricier packages that come with VIP experiences, food, premium parking, and more. Do note that you’re not guaranteed a seat with Grandstand admission tickets, nor with $60 Clubhouse tickets -- both are standing room-only. For reserved seats, you’ll have to opt for a pricier package. Kids 12 and younger are free. From NYC, you have two options: driving, or taking the Long Island Railroad, which sends extra trains back and forth to Belmont Park for the Festival for $12 round-trip. You can pick up the LIRR at Penn Station in Manhattan, Jamaica Station in Queens, or Atlantic Terminal in Brooklyn. If you have a car, know that parking isn’t cheap: It’ll cost you $40 and up, depending on the day and the lot. Belmont Park is right off the Cross Island Parkway, and it’s easiest to choose a lot based on the direction you’re coming from. If you’re going south on the Cross Island, take Exit 26D to the green lot. If you’re going north, take Exit 26A to the yellow lot. Shuttles are provided from these lots to the grandstand, as it’s a bit of a hike. The parking lots open at 8am on Saturday, and 10:30am on Thursday and Friday. “Preferred” parking lots, such as silver, clubhouse, and red, sell out fast despite the steep prices. Those passes should be purchased in advance, ideally when you buy your ticket. Horse racing is obviously the main attraction all three days. If you do find yourself in a “standing room-only” situation, don’t fret: High-def TVs will be all over, so you won’t miss any of the action. Windows to place your bets, as well as self-service kiosks, are located all over the park. If you go up to a window, you’ll need to state the race number, the amount you’re betting, the type of bet (“straight” bets are typically best for beginners), and the horse’s number (not its name). For example: “Fourth race, $10 to Win, on 5.” You won’t need deep pockets to have a bit of gambling fun: The minimum wager is $1. There will also be plenty to eat (and drink, from canned beer to The Belmont Jewel, the signature bourbon cocktail of the Belmont Stakes, depending on where you are). Two Coors Lite Food Truck Villages, with fare from Korilla BBQ, Souvlaki GR, Nuchas Empanadas, the Coney Shack, and other popular New York eateries, will be positioned at the Top of the Stretch and the Backyard areas. 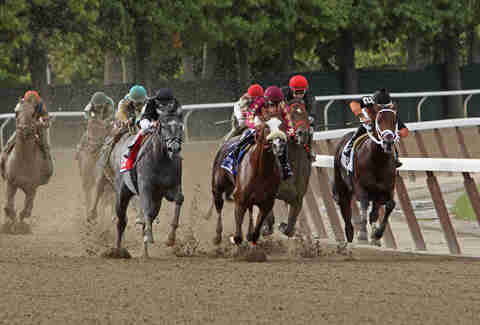 The Belmont Stakes tends to not have favorites as much as the Kentucky Derby and the Preakness Stakes, due to its unusually long 1.5 mile stretch. The distance allows come-from-behind types time to overtake the leaders, meaning the winners tend to be more of a surprise -- which, of course, only adds to the excitement. That being said, two horses, Cloud Computing -- who’s coming off a win at the Preakness -- and Classic Empire are largely considered the “favorites,” both with 3-1 odds. Classic Empire is getting a lot of attention in particular for being the half brother of American Pharoah, winner of the Triple Crown in 2015 (and the first horse to accomplish that feat since 1978). Be sure to also watch for the dark horse contender, a Japanese champion named Epicharis. The New York Racing Association, the organization that runs the Belmont Stakes, is offering a $1 million bonus to any Japan-based horse who wins the Belmont. While foreign horses tend not to do as well at the Stakes as US ones, Epicharis is unique. He’s been training specifically to win the Belmont Stakes, while American horses tend to be focused on the Kentucky Derby. If the spirit of the day makes you want to get on a horse yourself, the Jamaica Bay Riding Academy offers affordable riding lessons and opportunities to trot through the Gateway Wildlife Preserve, taking in a view of the water. It’s about a 30-minute drive from Belmont, heading back towards the city, off of the Belt Parkway. If you’re driving, you can also hop on the Grand Central Parkway to get to Flushing Meadows Corona Park, which has the Queens Zoo, Queens Museum, and New York Hall of Science. About a half an hour drive southwest is Rockaway Beach, home to the only surfing beaches in the city (they’re between Beach 67th and 69th Street and Beach 87th and 92nd Streets). Both are free to the public. Christina Vercelletto is a Long-Island based travel and lifestyle writer searching for a winery that will let her bring her chiweenie.